It seams that aderans has increase (as expected) the number of trials offices. Not only that, but thanks to that pic we now know that TKL Research was associated with Aderans Trials all along… Radiant Research too. guess they were making a test of the webpage and it slipped…but now it looks like the real deal…hope things are going well with their research!! And “Impact Clinical Trials” seems another company treating volunteers for ARI. Its exciting to see in the map, the magnitude of the trials. That was a good catch! we will have to watch for the next leak. Hi, I´ve been following Aderans research for some time and about a month ago i saw in their webpage that they updated their clinical sites map yet the next day they changed the map again. I´ve waited some time to see if someone else had seen this but no one has ever posted about this. 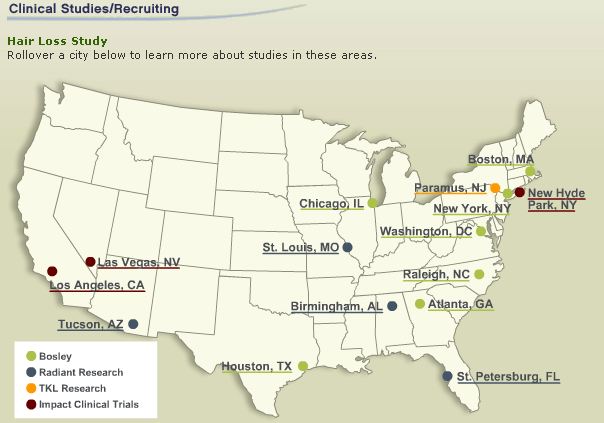 The change i saw was that not only was Bosley and TKL research doing the trails in the cities listed, but also Impact clinical trials and Radiant Clinical trials were listed on the map. The map had clinical sites also in L.A. , Las Vegas, Birmingham AL, St. Petersburg FL and somewhere in Ohio if i remember correctly. In total there were 15 different places. Agree, It would be nicer if they could cross the north frontier. Hopefully, this will happen with the Phase 3. Multiple test centers servicing hundreds of cohorts in the US. This is the most legitimate phase II test of an HM protocol to date. Pretty exciting stuff. Aderans has really taken the lead in this race. » stuff. Aderans has really taken the lead in this race. Out of curiosity, any of the members here plan on participating in this study? Or anyone know of someone else from another forum that may participate? Would be nice to have someone on the inside. » » stuff. Aderans has really taken the lead in this race. » participate? Would be nice to have someone on the inside. » This is amazing news. There was a member here who was part of the study, but he hasn’t posted in a while. The fact that they are expanding the Phase II trials (imo) means they are going well enough to warrant additional investment. If this was a total dud it would be dead by now. are there any opportunities to invest in any of these companies. i know its a long shot. » its a long shot. Aderans is a publicly traded company. I think its listed on the nikkei. I think whoever said that its a phase II + III trial was right. There is no way they would keep adding more sites if it was just a phase II trial. If they wanted to try out different formulations they could have easily done it at their initial trial centers. I think they are going for a high number of patients…which means probably phase III as well. Can anyone call them and confirm if they are still treating small patches or larger areas now? » of patients…which means probably phase III as well. » or larger areas now? Whatever they’re up to, they more than doubled the number of test centers. Could be part of the Phase II study, but given that they’re suppose to finish and present that study by the end of this year, that doesn’t seem likely - it gives them less than 8 months to recruit, experiment, analyze and report. So, either they are late on finishing the Phase II trial, they’re conducting an unplanned expansion of the Phase II study, or they’re prepping for Phase III. Posters in these new areas should keep their eyes open for ads recruiting for the study, as that should shed some more light on this. » » way they would keep adding more sites if it was just a phase II trial. » » of patients…which means probably phase III as well. » » or larger areas now? » Whatever they’re up to, they more than doubled the number of test centers. this really is the best news i’ve heard in quite a while! i’m really optimistic about this!! lets keep our fingers crossed and hope that with double as many trailists the information leakage doubles too! i’m dying to know how this stuff is working out. It was Iron_Man who said this was a combined PhaseII+III. I think this is just a Phase II trial. Small patches in the scalp (as reported by our insider), but they are testing different variations (this would explain the high numbers of trialists). I assume, when they have an optimum technique, they will proceed to phase III on larger areas of the scalp. Phase II could have more trialists than Phase III because they have to test many different variations. » It was Iron_Man who said this was a combined PhaseII+III. » would explain the high numbers of trialists). » III on larger areas of the scalp. » test many different variations. i don’t remember exactly from where i read it but somewhere were written that fda phase 2 has about 200-300 trialists and Phase 3 has over 1000. i don’t know are these 100% correct numbers. » » » of patients…which means probably phase III as well. » » » or larger areas now? » » It was Iron_Man who said this was a combined PhaseII+III. » » would explain the high numbers of trialists). » » III on larger areas of the scalp. » » test many different variations. » don’t know are these 100% correct numbers. I recall reading something along them lines! A poster called shooter from xconomy called them. He does post on here every now and again so I don’t think he’ll mind if I put his post about his conversation with them up. I called the number on the Aderans site for the clinical trial nearest to me. I talked to a lady from the research facility who was extremely nice. She said they hadn’t started recruitment just yet, but that the study itself should start in May. Overall it lasts for about a year. She said that the majority of the procedure is done during the first few visits and then its mostly just monitoring afterwards. That being said, she is just an employee and is not given any information with which to make that decision. She just knows that they are a late-term facility so by the time trials get to them they are usually safe and at least minimally effective.